Former U.S. Secretary of State, Condalezza Rice, first dubbed Belarus the, “last dictatorship in Europe,” over ten years ago, and ever since Western powers have treated the country like a pariah. Until, that is, President Lukashenko adopted a ‘neutral’ position, even criticizing the Kremlin for supporting the pro-Russian republics in Ukraine. Diplomats and military experts now call for the West to engage more actively with this authoritarian state. Hit by economic crisis, Lukashenko is looking desperately for help. He declared that EU citizens no longer need visas to visit the country. This is of huge significance because, until now, Belarus and Russia had a common visa regime, with no passport controls between the two countries. Now Russia has restored its border guards and passport controls. This is taking a big step towards the break-up of the Union between Russia, Belarus and Kazakhstan. 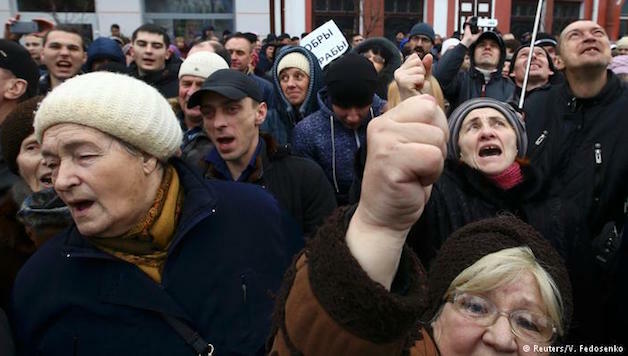 Discontented Belarusians are flooding onto the streets to demand the abolition of a new punitive law against the jobless, referred to as the “law against parasites” by the regime, and, in general, against a drop in living standards. Russian socialists call for protests against the new law and against the wave of repression, including against socialists. We call for messages of protest to be sent to the embassies of Belarus in advance of the next wave of protests on March 25. The “Law against parasites,” introducing a new tax on the unemployed , is one of the foolhardy ideas the President has ever had, and has proved to be the last drop leading to the cup of discontent overflowing. Lukashenko reckoned that by introducing this new tax on the self-employed – most of whom are small-time traders forced into this situation after being made unemployed from industry or the retail sector – he could find money to fill gaps in his budget. But this measure has proved to be a huge blow against the most vulnerable section of the population. In response, people used social networks to organize and, ignoring the requirement to seek official permission to protest, came onto the streets. Spontaneous actions took place over the weekend February 17-19, with 5,000 on the streets of the capital, Minsk. Demonstrations of anywhere between 100 and 1000 took place in the other major cities of Gomel, Mogilev, Grodno, Vitebsk and Brest. Demonstrations continued all week, with 1,500-strong protests in Vitebsk and Bobruisk and hundreds more in Brest and Baranovich. This appears to be only the beginning. Notwithstanding the speech by Lukashenko, in which he said that the new law was being suspended because the ministers responsible had implemented it badly, protests are growing. Although Lukashenko warned that he would allow no “Maidan” in Belarus (referring to the anti-regime protests in Kiev, which led to the fall of the president and widespread armed conflict in Ukraine) and has been stepping up repression, further protests are planned for the next weeks. Society has been electrified by the crisis. Discontent at the new law was soon transformed into political demands, with calls for the resignation of the government and the President. The fragmented and dispirited Belarusian opposition is completely disorientated. These protests differ from those that occurred earlier, in that they are dominated by working people who are protesting that they are not allowed to work or earn a decent wage. The Belarusian national flag that is usually in prominent display at opposition meetings was noticeable by being practically absent, with only a few to be seen. Further protests took place across the country on March 15, once again defying the threats of arrest and again with the involvement of youth. Mainly working class demands are raised at these protests. Having been awoken from their slumber by the protests, some opposition leaders are now calling for further big protests on March 25. The state-controlled media quickly declared that the protests had been whipped up by “external forces,” by which they mean Russia. On the day of the latest protests, Lukashenko announced that he was withdrawing the country’s delegation from the customs union with Russia, while opposition leaders who have called for action have been tarred as Putin’s agents. This new rhetoric from the authorities is no longer a surprise – the need for the union state (with Russia), which for years has dominated the propaganda of the President – is now suffering a severe shock. Lukashenko spent much time in negotiations with Russia trying to get a cheaper price for energy and hoping to stabilize the economic crisis but with no success. Russia, his former close ally, has been turned into the enemy. After the crisis in 2011, the economy slipped into recession, GDP has fallen for the last two years, by 4% in 2015 and 2.6% in 2016. Forecasts for GDP in the next few years are all negative. State investment in industry, the main motor driving growth in the Belarusian economy in the noughties, is now a thing of the past, along with cheap energy. This means that many state and semi-state organisations, and even whole sectors which are dependent on state subsidies, have to cut expenditures, cut wages and sack workers. The Belarusian opposition, European advisers, the Russian government and the neoliberal opposition all see the cause of the crisis as lying in an “inefficient market” and insist on more privatization, that is, the mass sell-off of factories and production. The rules of market transformation simply need to be cleverly adapted to our specific situation, argue Belarusian experts. These economic doctors believe that you can cure the ills of the market by feeding it with more market. But their measures will only hasten the social catastrophe and pauperization of the masses, as happened in Russia in the nineties. But Lukashenko has no other plan. He just keeps loading the economic problems of the government onto the shoulders of working class Belarusians. Despite the fall in real incomes by more than 15% in the last couple of years, he has cut the social budget, both directly and indirectly, to force living standards down even further. He has increased the pension age. He has increased the price of gas, which has, in turn, forced up utility prices. Now he has even introduced a tax on the unemployed, in the hope he can earn revenues for the budget – he wants to collect 4% of budget income in this way! Thus the mood of the masses in Belarus is changing quickly, in line with the sharp increase in poverty. Once fondly called “Batka” (“Old Man”) by many, Lukashenko is increasingly seen as a political bankrupt. He has not fulfilled any of his earlier promises, nor does he propose any serious new plans. Opinion polls suggest that since the crisis in 2011, there has been a sharp drop in his support; 60% now say they have no confidence in him. In an opinion poll just before 2016’s parliamentary election, 25% said they would vote for Lukashenko’s candidate, 26% for his opponent and 24% for a candidate with no connections either to Lukashenko or the opposition. This mood was reflected in the result of the election – notwithstanding the traditional mass ballot fixing – when, for the first time in 13 years, two opposition deputies managed to win seats. Without the resources to support the former level of social guarantees, today Lukashenko maintains himself in power using foreign credit and repression. As long as these factors continue, he is able to present himself as father of the nation and as a great ruler. But the price for this is a sharp increase in the state debt. In just a few years it has reached 78% of GDP. If Lukashenko can find willing lenders, this may continue. However neither Russia nor the West is willing to finance the Belarusian regime without guarantees of market reforms and the privatization of state property. But neither the Russian state nor the IMF are charity organisations led by kind uncles who are only thinking how they can save the Belarusian economy. They are cold-blooded and pragmatic dealers, worried only about their own profits. Money should make money; credit should have a guaranteed return and be paid with interest. But market reforms will inevitably lead to further falls in living standards, and, in turn, discontent will grow even faster, threatening the president with a Minsk version of Maidan. But if he continues with his policy of increasing the state debt and the economy continues to stagnate, then another crisis awaits – a state default. In other words, by driving the country into this dead-end, Lukashenko has placed himself in a position where he has no way out. He has no room for maneuver. He will inevitably face a conflict with the Belarusian masses. Negotiations with the Kremlin for a discount on the gas price are the only hope he has to lessen the blows on the economy and to re-win the confidence of at least a section of Belarusians. If You Don’t Stay Friends – We’ll Switch the Gas Off! The attempts of the Russian oil and gas oligarchs, on whom Putin’s regime rests, to influence the political relations between the two countries, override the patriotic rhetoric about the need for a strong union of brother nations. Russian imperialism has long used the price of gas as an instrument for applying political pressure on neighboring countries, which are dependent on Russian energy resources. The “gas war” with Kiev was renewed with reinforced energy after every victory of pro-western political forces and played a big role in creating the instability of Ukraine’s economy. They eased off only temporarily after pro-Russian forces came to power, who sold their loyalty to Putin for a small discount on energy prices. Russia uses the same approach in dealing with Belarus. Lukashenko was prepared to sign any “loyalty pact” and even agreed to join the union state with Russia. Gazprom agreed to a compromise, and for a period the price of Russian gas in Belarus was the lowest in the CIS. But the global crisis changed all this; Gazprom’s income began to fall while its expenses continued to climb. Loyalty came with a new price – the need to agree with an increase in prices for energy resources. The pressure of the oil and gas oligarchs rode roughshod over the logic of political union. As card players know, there’s no friendship in poker! Gazprom’s budget for the next three years is expected to continue in deficit. Its earnings for 2016 were the lowest for 12 years notwithstanding the growth in actual production. It has no money to allow Belarus a discount. Russian capital has for years been involved in many sectors of the Belarusian economy, in construction, food, chemical, banking, IT and property. But, so far, the government has not allowed it to intervene in large-scale privatization. Now the process of selling state property to Russian capital is the subject of fierce negotiations between Lukashenko and Putin. But Lukashenko is also negotiating with the IMF. Who will offer better conditions is not yet clear. But what is clear is that whatever is offered will not be in the interests of the working class of Belarus or of those layers of the population who have similar interests. Practically all the opposition forces who want to take power from Lukashenko are pro-capitalist and they will all try to take over leadership of these new protests. But the process will be far from easy. The experience of Ukraine’s Maidan and Georgia’s ‘Rose revolution’ and the subsequent Russian intervention and wars remain in the minds of Belarusians. There is no guarantee that something similar could not happen in Belarus. The working class cannot but understand this. A program is needed that offers an answer not just to oppose Lukashenko and the pro-capitalist right-wing opposition, but also against any attempt at imperialist intervention, whether by Russia or by western interests. This should be based on the understanding that the only way to guarantee a genuinely independent Belarus is through solidarity in struggle with workers in Europe and the CIS against their own governments. Socialists should place themselves at the forefront of these protests and openly call for an end to the Lukashenko dictatorship, not through an ‘orange revolution’ but through a workers’ revolution.